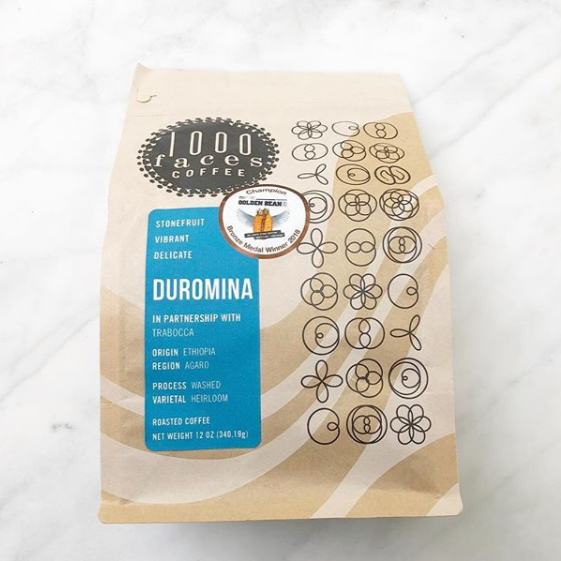 “Duromina” from 1000 Faces Coffee. This coffee come to us from 1000 Faces Coffee, who produced the best coffee of 2017. This Ethiopian Coffee certainly lives up to the reputation as being a unique & delicate coffee. This by far was one of the most difficult coffees we’ve ever reviewed. It’s a single origin coffee grown by the Duromina Co-op in the Arago Region of Ethiopia. The word delicate, which they used on the label is a perfect word to describe this coffee. As an espresso it was uniquely light and had a consistent flavor of stonefruit. This is an award winning coffee from 1000 Faces Coffee and certainly was one of most unique coffee we’ve reviewed this year. It was extra light almost airy on the tongue. It had the same flavors as the espresso with some honey and stonefruit.